President Hugo Chavez ordered the disappearance of Radio Caracas Television (RCTV), the principal television operator of Venezuela. Friday May 25, the army received the order of the Supreme Court [TSJ] to take the control of the buildings and installations of RCTV, in order to “ensure a serene transition” with the official chain which will replace it. The non-renewal of the concession of RCTV, created fifty-three years, deprives a popular public of its favorite programs. Serials, spectacles and humor constitute the essence of its programming. The identification with these programs encouraged part of the abandoned elements of Venezuelan society to express their complaints with the authorities via the microphones and cameras of RCTV. This role an echo chamber for their dissatisfactions undoubtedly annoyed the Chavez government as much than the programs of information and opinion devoted to the opposition. None the charges carried by the president against RCTV, in connection with his role in the missed coup of 2002 or the oil strike of 2003, was the subject of a debate in front of a court. The Supreme Court was solicited by RCTV whereas Mr. Chavez had already announced his decision, irrevocable. This political decision reduced pluralism and increases the concentration of audio-visual tools within the hands of the government. Whatever the administrative or legal arguments called upon by the president, it is a hard blow carried against the freedom of expression in Venezuela. The replacement of a private chain which was open to the opposition by a public chain circumstantially created piece meal is presented by the state power like “a democratization of the media”. The government controlled already several chains and had gained by various means the favors of the majority of the others. 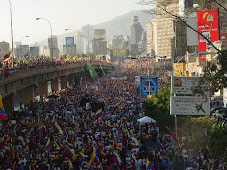 Following the disappearance of RCTV of the hertzian waves, Monday May 28, there will not remain but one opposition chain, whose [open] signal does not go beyond Caracas and whose audience is negligible. In December 2006, neither RCTV nor the opposition prevented the re-election of president Chavez with nearly 63% of the voices. The National Assembly, where the totality of the elected officials are acquired to him, became a simple registration room. The Head of the State moreover made a point of benefiting from special capacities allowing him to legislate. Justice does not dare to contradict the executive and does not escape the generalized corruption. Just to make things clear: this is not Le Monde Diplomatique which is another paper that has nothing to do with Le Monde anymore but which managed to retain the title wording for the obvious publicity advantage. Le Monde Diplomatique is a mercenary paper through its director Ignacio Ramonet who has no problem flying to Caracas to support his master, widely murmured to have paid for the Paris new headquarters of that yellow racket. Le Monde is a very serious paper who people critical of its editorial line read anyway. I remember even a picture of Chirac reading Le Monde in the railway during one of his campaigns. It is also a paper that endorsed Segolene Royal in the recent elections, so there is no way to corner it as a right wing paper, paid for by Bush or any other inanity that the chavista crowd might want to use to disqualify it. You would be hard pressed to find kind words for Bush in Le Monde. At any rate, such an editorial assures that the next French government that comes from the June legislative elections will not be a friend of Chavez. And as yet another public relations disaster for Chavez, it ranks way up.